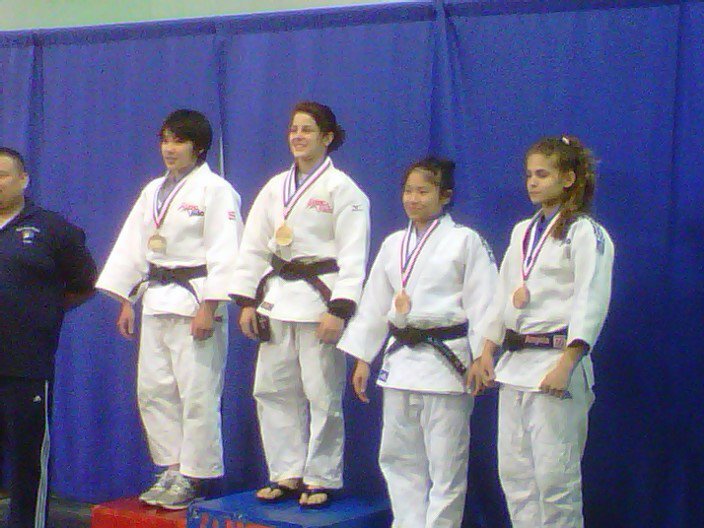 The 2010 USA Judo Senior Nationals were held in Myrtle Beach, South Carolina on May 1-2. Representing EBJI were Molly O’Rourke and Ann Shiraishi, both former Senior National Champions (Molly in 2003 and Ann in 2008). Both Molly and Ann walked away with Silver Medals. In addition, Ann solidified her spot on the 2010 World Championships Team, which will be competing in Tokyo, Japan from September 9-12, 2010. Molly competed in the women’s 78+kg category. Below is her account of her experience. “Senior Nationals, 2010 in Myrtle Beach, South Carolina marked my big return to competition. It was a nice feeling going into a national competition with no pressure to win and being excited about competing. The location was incredible; I was able to hang out at the beach every day that I was there, slathered up in sunscreen because I would have turned into a lobster had I not. The competition wasn’t as nice as the beach, but I still enjoyed myself and took second place. Had there not been a wrong call by the referee I would have taken first, but you can’t win them all. In my weight class, +78 kilos, there were five competitors including me, meaning I fought everyone for a total of four matches. Being in the unlimited category is a new experience for me, and the girls are not as easy to throw or move around. I was able to win my first match with a pin; those first matches always are the hardest. My second match was just a challenging as my first, except for the first half I was on the loosing side. My opponent came out very aggressive and it took me two to three minutes to figure out what I was doing. I was able to keep up with her pace and started doing some judo of my own, which lead me to tie the score in the last seven seconds sending us to golden score. I was able to maintain the intensity while my opponent started to get tired, and I threw her for a yuko to win the match. My third match I came out and was dominating my opponent for the entire match until I did a leg grab in continuation with a throw. The referee and judges determined that was a straight leg grab and gave me honsokumake, direct disqualification. I was disappointed in losing the match, but after the referee jury saw the video they said it was a wrong call but could do nothing to rectify the mistake. My fourth and final match I was able to win by ippon with an ouchi gari. With three wins and one loss, I ended up with the silver medal. Overall I had a lot of fun in Myrtle Beach, the competition was fun, the beach was awesome and I found out how I stand nationally after not competing for two years”. Annie compted in the women’s 48kg category. Below is her account of her experience. “We arrived in Myrtle Beach the Friday morning before the competition, after a long, red-eye flight. After taking a short break, we went on a run to get my weight down. Surprisingly, I lost more weight than I had anticipated and was able to eat a decent amount after working out.I spend the rest of the evening just resting and relaxing. The next day was the first day of competition. It started with the heavyweights and Molly fought. Nationals was also a great day for Molly. I was excited to watch Molly compete for her first Nationals in two years when she decided to stop competing. Molly looked great! She represented EBJI well by winning the silver medal. The next day after weighing in and eating a good breakfast, I was ready to compete. I only had 6 girls in my division and because I was seeded number 1 going into the tournament, I got a bye to the semi-finals. My first match was against a girl I usually compete against from San Jose. I felt pretty decent and was able to win the match, putting me into the finals against Katelyn Bouyssou, whom I’ve fought on multiple occasions. I went back up to my room after lunch to rest and prepare for the finals. I went into the finals being prepared to win, but was caught off guard when I was thrown in the first exchange of the match for wazari. I couldn’t really get anything going and ended up getting pinned about halfway through the match. I was disappointed with my performance, but view it as another learning experience to help my judo progress for the better. Although I wasn’t totally satisfied with my performance or results, I came away from the tournament with a silver medal and a spot on the 2010 World Team. Now, I have to prepare for a long summer of competitions and training leading up to the World Championships in September”.